This Halloween, get ready for the cutest match 3 adventure ever! Enjoy beautiful match 3 puzzles with captivating music and feel the spirit of the holiday from the comfort of your computer! Match zombies, witches and other Halloween creatures! 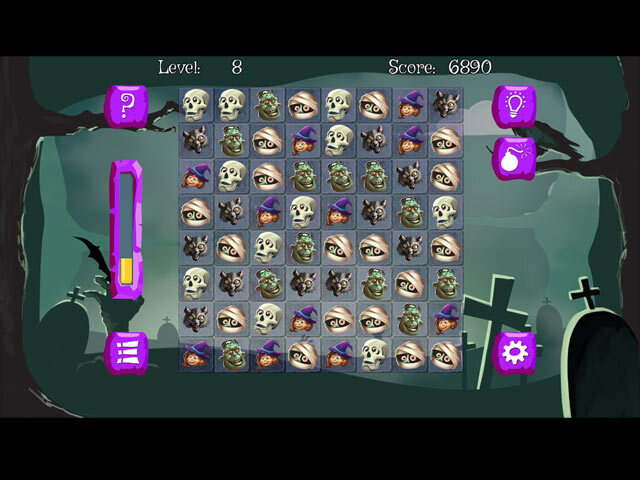 Be brave as you face these spooky puzzles and reach the next levels of fun! 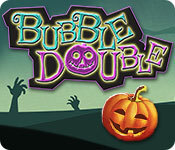 Bubble Double Halloween is rated 1.5 out of 5 by 14. Rated 5 out of 5 by tailswhiskers from A good relaxing game This is a good game to play if you want to just sit and play. I could play this game all day. I have not yet gotten to the end of the demo. I want to buy this game. There is nothing to it. I would recommend this game to anyone. Rated 2 out of 5 by cowclaudia from Completely mystified Have no idea what the purpose of this game is other than mindless clicking - play one level then exit, later one level, exit, on and on. Kids might like this game - not for adults. Rated 2 out of 5 by dhoneykids3 from Double Disappointing This game has cute Halloween icons on the m3 screen, and a cute little Halloween tune. Graphics are fine, a little dull in color. Sadly, that is all there is. Not a m3 where you make a match moving tiles together to match 3 or more, this is a click on a group of 2 or more. There is no goal, no quest, no building, no power ups to buy. Just click on 2 or more till the bar on the left side of screen fills up, then you do it over, and over, and over....... I think even young players would get bored of this sad little game! 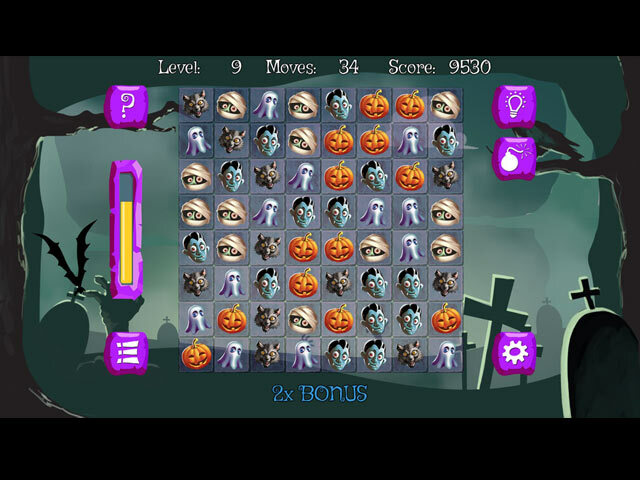 Was waiting and waiting for Big Fish to release Halloween games, this year is a huge disappointment! It's either this or Halloween Bingo, Halloween Mahjong, Jigsaw puzzles, Mosaics, or Solitaire. I was hoping for Halloween games with some substance to them, like a story line, or the next part of Halloween Trick or Treat. Well, I will replay the fun ones I already have. Happy Haunting. Rated 2 out of 5 by bessiegirl from Just for kids... I gave this game a try because I like the occasional match 3 which are few and far between on Big Fish, but this one is truly lacking. I played the "hard" mode in both moves and score (the only two available) and the game was just really boring and without any challenge at all. I couldn't imagine trying to complete the game. Had to turn the annoying music off, but the graphics were bright and colorful. Like I said, a good Halloween game for those under 8 or 9. 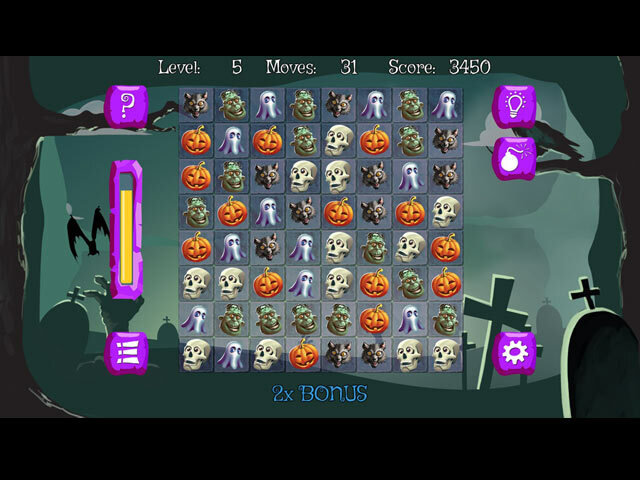 Rated 1 out of 5 by maxzer from Oh No What Happen I love Match 3 games but Bubble Double Halloween is not one of them. I played the demo for about 10 minute hoping it would get better. Well much to my disappointment it not. Not exactly a Match 3 game though so maybe that is why I uninstalled after 10 minute. The is no storyline or goal in the game that I can see. Shame it looked promising. Maybe this game is targeted to kids. Rated 1 out of 5 by pennmom36 from BUBBLE DOUBLE TOIL AND TROUBLE This could have been an epic Match 3 game, but instead, it's a simplistic disaster. I'll be honest with you, I only played this game for about 15 minutes, I don't get why anyone would find this interesting, unless it somehow appeals to the youngsters. This is a very basic game with no thrills or frills, but mostly no fun. The object of the game is to click on groups of identical tiles to remove them. You can choose to play in a Score Mode, or Limited Moves Mode, and then choose to play in an Easy or Hard Mode. The first Bonus you receive is a Bomb that takes out just one tile, BUT, you will be penalized 1 point or 1 move if you use the bonus. I'm sure other Bonuses are added as you progress, but as I said earlier I didn't hang around long enough to find out. The music was good for about a minute and then just became repetitious and annoying. Rated 1 out of 5 by deddu from No Matching There is no challenge here -- you just click on two or more zombies, etc. Very monotonous. Rated 1 out of 5 by Innovativemom from Yawn!!!! There was no challenge even on the hardest level. I think that most children over six years old would get bored after playing this game for a short period of time. Rated 1 out of 5 by JoJo1208 from Boring and pointless No clear goals, no challenge, no fun at all.